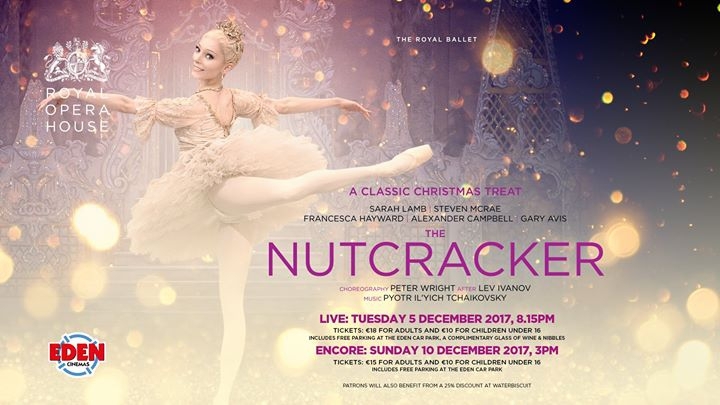 The opening night of The Royal Ballet’s The Nutcracker will be screened live at Eden Cinemas on Tuesday 5 December at 8.15pm with an encore screening on Sunday 10th December. A firm family favourite with Tchaikovsky’s mesmerizing score, a Christmas tree that magically grows, a battle between toy soldiers and an Army of Mice, and the famous role of the Sugar Plum Fairy danced by Royal Ballet Principal Sarah Lamb with her Prince, Principal dancer Steven McRae, this event presented by Darcey Bussell is not to be missed. Peter Wright’s enchanting production tells the story of Clara, danced by Royal Ballet Principal Francesca Hayward, whose Christmas is transformed by a visit from Drosselmeyer, a mysterious magician and maker of magical toys. Drosselmeyer longs to break a curse that has turned his nephew, danced by Australian Principal Alexander Campbell, into a nutcracker doll. Matched with exquisite designs and world-famous melodies, this production of The Nutcracker has enthralled audiences for over 30 years since its opening in 1984. It showcases the full energy of the Company, alongside the emerging talent of young dancers from The Royal Ballet School. The stunning costumes, numbering around 600 and dating back to the world-premiere, are revitalized for the show. Tickets for The Nutcracker are being sold at €18 for adults and €10 for individuals under the age of 16. This includes the pre production wine and nibbles and complimentary parking at the Eden car park. An encore screening takes place on Sunday 10th December at 3pm. Tickets for this are priced at €15 for adults and €10 for children, including free parking. Patrons will also benefit from a 25% off at Waterbiscuit, on presentation of their cinema ticket. The event is sponsored by Vivian Corporation, Villa Sandi, Casa Modena, Encore magazine, The Malta Arts Council and Waterbiscuit. The next production in the Royal Opera House’s 2017/18 Live Cinema Season is Verdi’s opera Rigoletto on Tuesday 16 January at 8.15pm. For tickets please visit www.edencinemas.com.mt or the Eden Cinemas Box Office.